Waterproof, fog proof, fully multi-coated optics, BAK4 prism. Includes nylon carry bag, camera adapter attachment, and lens cleaning cloth. Ready to attach to your ¼-20 tripod. 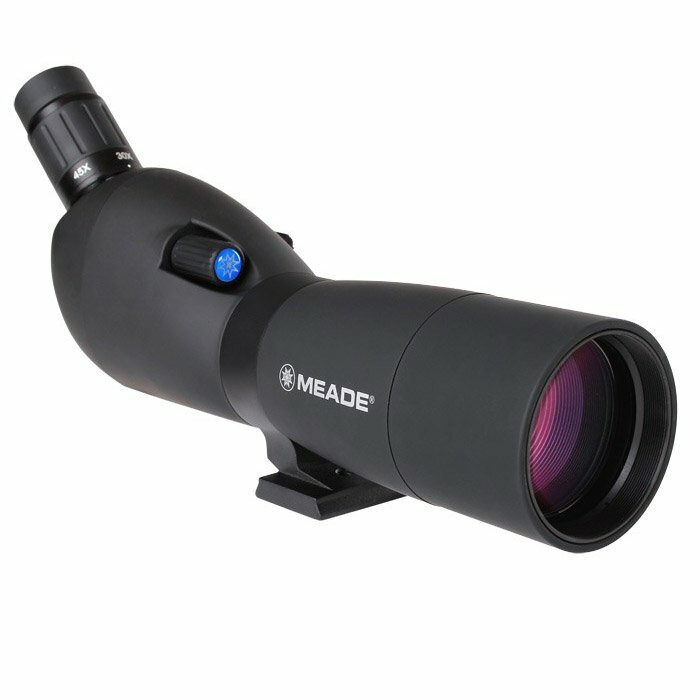 This 45° angled-viewing 15-45x65mm Wilderness Spotting Scope from Meade features fully multicoated optics and a 15-45x zoom magnification eyepiece that provides clear and bright images when viewing at mid to long range in all weather conditions. On the right side of the body is a fast-focus knob and on the left is a sight tube that runs parallel to the optical tube to aid in finding your subjects faster. The aluminum alloy housing is nitrogen-filled and o-ring sealed to be water and fogproof. It also has a rubber armored exterior that protects it from impacts. A digiscoping camera attachment is included that slides over the eyepiece, and accepts most user-supplied camera-specific T-mounts. Meade high-quality, 15-45 power, zoom porro prism spotting scope delivers years of use. Large 65mm objective gathers plenty of light for bright detailed images. Features high index BaK-4 prisms and high-quality, precision ground lenses that are coated with multiple layers of anti-reflection coatings to provide optical performance that is equal to, or better than any spotting scope in its class. Features a sliding sunshade to further reduce glare. Waterproof, fog-proof, and nitrogen purged to ensure many years of performance regardless of the environment. Comes standard with a soft case and camera adapter (requires T-Mount, not included). Product carries limited lifetime Meade factory warranty (within US/Canada only).